Although most brands of vinyl siding offer warranties against cracking and breaking, occasionally your home's siding may be damaged. If this happens, you may want to install a new siding panel to replace the one that is broken. 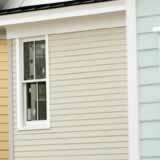 When you install house siding, consider the expansion and contraction of vinyl panels due to weather. To ensure that siding does not warp when the panel expands, leave about 1/16 of an inch between a nail head and the surface of the panel. In addition, leave about 1/4-inch gap between the ends of the siding panels, all corner posts and trim pieces. Slip the siding removal tool behind the bottom edge of the panel located above the one that needs replacing. Slide the tool along the edge of the upper siding panel and "unzip" the locking mechanism on the damaged panel. Gently bend out the upper panel so that you can access and remove the nails holding the damaged panel in place. Remove the damaged panel from the wall. Position the new siding panel on the wall, locking it into place by snapping it to the adjacent panel. Use the siding zip tool to relock the upper and lower panels. This is the reverse of step two. Using a nail punch, nail the new panel in place using manufacturer approved fasteners, such as galvanized nails. If this is your first time taking on a DIY siding replacement project, start with a single panel. When in doubt, consult the manufacturer, or call a siding contractor.